MOSCOW, September 16. /TASS/. Saudi Arabia’s air defense units have shot down a missile launched by members of the Ansar Allah (Houthi) movement in Yemen and targeting the Saudi border city of Jizan, Sky News Arabia reported citing Saudi-led coalition forces in Yemen. Earlier, the Ansar Allah-controlled TV channel Al Masirah said a Badr-1-class missile was launched at the Jizan economic zone. Commenting on the information, coalition spokesman Turki Al-Maliki said: "the Saudi missile defenses have intercepted the missile, launched by Houthis from the province of Saada." "It was a deliberate attack, targeting civilian districts," he said. No deaths or damage on the ground have been reported so far. Earlier, Ansar Allah has repeatedly reported about strikes to Saudi territories close to the Yemeni border, including the cities of Jizan and Najran. Saudi Arabia said all those missiles were shot down. According to the Saudi-led coalition forces in Yemen, over 190 Houthi ballistic missiles have been intercepted so far. 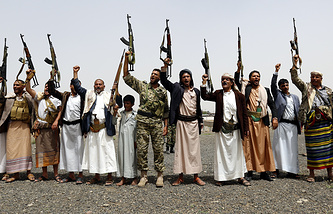 The Ansar Allah movement also used combat drones, which they claim targeted the international airports in Dubai and Abu Dhabi and the Saudi Aramco refinery in Riyadh. The Saudi and UAE authorities have denied those reports. On Friday, it was reported that a Saudi Aramco oil processing facility in Jizan came under a missile attack from Yemen. The coalition said the missile was intercepted. The president had to leave the country’s capital of Sana’a and it is now controlled by the Houthis, as well as Yemen’s largest Red Sea port of Hodeida.